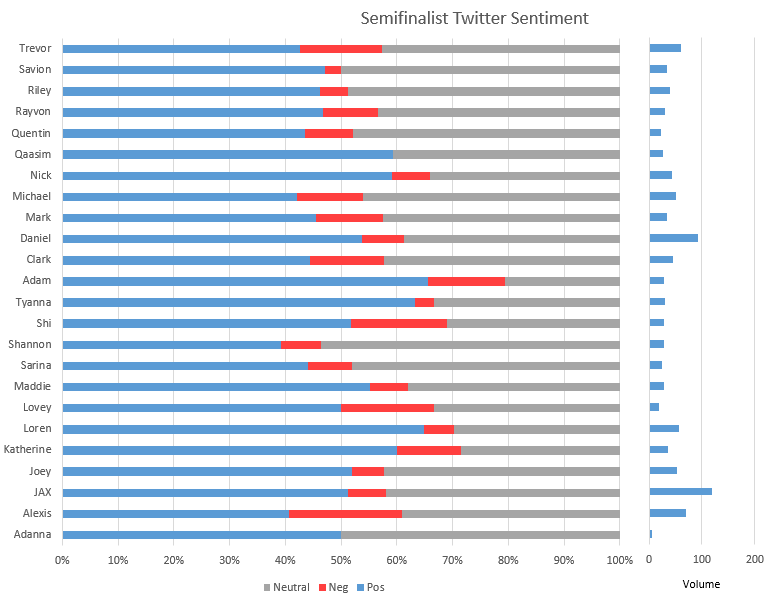 Twitter sentiment analysis is an attempt to ascertain from a sample of tweets how people feel about a certain contestant. It’s a convenient, though debatably accurate, way to judge how much people like someone. For instance, someone may try to determine how popular Obamacare is by doing sentiment analysis. He could collect a certain number of tweets from Twitter, and then use an algorithm to determine whether the tweet is positive, negative, or neutral. That algorithm is trained using a large sample set, and seems to do a pretty good job. For American Idol contestants, a tweet that says “My faves are Tion, Daniel & Trevor #idol” would indicate that the user was positive about Trevor, whereas a tweet like “oh and I guess Trevor’s not so bad either @TrevorDmusic” would be more neutral. A tweet like “Watching tonight’s #Idol. So annoyed that Shi and that kid keeps getting through, Shi is good but completely unoriginal. #idol” would be decidedly negative. But you notice that that tweet also probably refers to Trevor negatively, but wasn’t counted as such because it did not mention Trevor by name. We’re still pretty early on, so the volume of tweets is not huge for some of these contestants yet. Jax and Daniel have picked up quite a lot of Twitter followers and are rated rather popular, with a low number of negative tweets. Trevor and Alexis have a lot of negative tweets, but with smaller tweet volume. I collected up to 500 tweets, or however many were available. I expect this will increase substantially as we proceed.